Born 1952, Eddrich, Kentucky lives in Isonville, Elliott County, Kentucky. Life's work changed for Tim Lewis following a crash of his brother Junior's loaded coal truck on a steep Kentucky mountain pass. 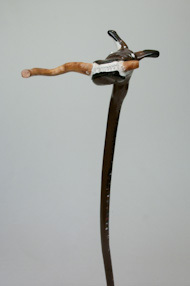 He began carving, at the age of 36, working with saplings of small hardwoods found on bordering property. Abundant, maple and dogwood became his favorites for canes and walking sticks. We have a fine example dated "88" we purchased the same year at Art Jones Gallery for which Lewis cleverly used a portion of the root ball as the dog's head with a stick in his mouth. The staff was the now bark-less sapling. It is painted minimally to focus attention on the dog's eyes and mouth with teeth grasping the natural stick. 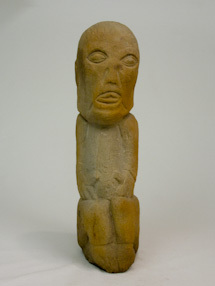 Lewis, who lives in Isonville, Kentucky, as referenced by author Ned Crouch in "Time Made Real The (Stone) Carvings of Tim Lewis" began carving in stone in 1989. His subject matter is most commonly animals, biblical subjects such as the Garden of Eden and Noah's Ark, and figures. 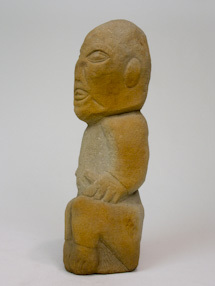 We purchased a sandstone piece dated 1990 at an auction of private collections presented at Kimball Sterling in Johnson City, Tennessee in April of 1997. It is a human or fetal figure only 21" tall. Lewis has exhibited in regional shows including "Generations of Kentucky." The exhibitiion "Local Visions: Folk Art from Northeast Kentucky" a show which originated in Clarksville, Tennessee in 2008 traveled then to Columbus, Ohio, as well as Orlando, Florida before it's stay at the Kentucky Folk Art Center in Morehead, Kentucky. 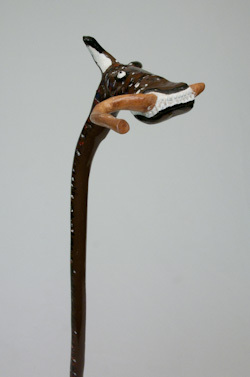 Tim Lewis is represented in the permanent collection of the Owensboro Museum of Fine Art, the Huntington Museum of Art in West Virginia, the High Museum, Atlanta, Georgia, as well as the Smithsonian American Museum in Washington, D.C. His work is also included in George H. Meyer's "American Canes: Personal Sculpture." Considered a self-taught master, his meticulous work is highly desirable by private collectors.